Two sources close to the process of selecting a new Madison Schools Superintendent tell 27 News the position has been offered to Green Bay School District Superintendent Daniel Nerad.Green Bay School District spokesperson Amanda Brooker told 27 News Nerad, 56, would not comment Monday on the selection process.Madison School Board President Arlene Silviera also declined comment.School Board members had identified Nerad, Miami-Dade Public Schools administrator Steve Gallon, and Boston Public Schools Budget Director James McIntyre as the three finalists for the position.School District officials have said an offer of the job would be followed by salary negotiation and a site visit by school board members to the candidate’s home area. 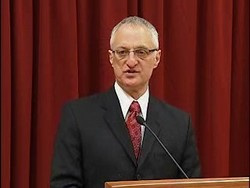 Nerad is a Wisconsin native who was named state superintendent of the year in 2006. Nerad told the Capital Times last week he has passed on other appealing offers to leave his Green Bay position during his thirty year career there. Nerad told the newspaper the Madison opportunity was “unique” because of his admiration for the district’s work and his family’s strong ties to the city. Nerad’s son, Benjamin, is a Madison-based legislative aide for Rep. Tom Nelson (D-Kaukauna). If Nerad accepts the position and contract terms are finalized, he would replace Superintendent of Schools Art Rainwater, who retires June 30. (I think) I can say now, he was my first choice. In his public discussion, he hit John Dewey, equity (in a way that I liked), state school finance reform and was great on community involvement and the idea that schools are about more than academic learning. Dewey is a hero to me and the others are issues and ideas near and dear to my heart. Much good about the others, but Nerad fit my desires best.